The Poconos Mountains has a little bit of something for everyone. Crave water adventure? The Three large state parks with lakes have boating facilities for kayaks, canoes and rowboats. Want a quiet place to hike or mountain bike? The Poconos thousands of wooded acres have lots of places to get away from it all, with many trails that wind through the parks. Outdoor camping in recreational vehicles, tents and Cabin vacations make the Poconos a welcome place for families looking to enjoy the Mountains, Lakes, River and Streams, but escape the hustle and bustle of some of the nearby towns. The Poconos Mountains in Eastern Pennsylvania has a wide variety of developed camping locations, offering beautiful scenery, solitude, lake and river access, and unique features. Most of these campgrounds are located within or near rugged, mountainous terrain, and are designed to blend into their natural surroundings. Most campgrounds within the Poconos Mountains offer primitive, tent camping sites. Some, however, do allow camping trailers, an many have hookups available. Many campgrounds do offer water spickets, and some even have dump stations as well. Also, some campgrounds have only vault toilets with no showers, while others have full bathroom/shower facilities. Most campgrounds have picnic tables and/or a pavilion. Camping is a lot of fun, but please keep in mind that good manners are as important in the outdoors as anywhere else. Please keep in mind that quiet hours are from 10:00 pm to 6:00 am. Others want to sleep for their big day floating, exploring the Poconos or may have children who go to bed early. Please respect your neighbors. Keep a clean camp , small critters like skunks, crows and raccoons will certainly visit you, looking for a handout. Be prepared to keep your food and garbage either in a vehicle or hanging up high. Otherwise you may wake up to a mess and no breakfast! We have bears in the area, they haven't been a problem yet and we want to keep it that way. Please help by not making it easy for them to steal food or garbage. ARROWHEAD CAMPGROUND: Beaver Valley Rd., Stroudsburg. 570-992-7949. ASHLEY RV CENTER: Honesdale.570- 253-3030. BLUE MOUNTAIN RV & CAMPING RESORT: Lehighton. 610-377-5313. CHERRY RIDGE CAMPSITES & LODGING: Honesdale. 570-488-6654. COUNTRYSIDE FAMILY CAMPGROUND: Rt. 670, Honesdale. 570-253-0424. CRANBERRY RUN CAMPGROUND: 489 Hallet Rd., Analomink. 570-421-1462 / 6464. Cranberry Run Campground is nestled on 65 wooded acres in the scenic Pocono Mountains. Conveniently located just minutes off of Route 80, our campground offers families a relaxing natural atmosphere with a wide variety of local attractions. We offer seasonal camper sites, full service and rustic tent sites, and cabin and Lean-To rentals. Groups are welcome. Come see what the Poconos have to offer! DELAWARE WATER GAP K.O.A. : Hollow Rd., East Stroudsburg.570- 223-8000.Stay in one of our cozy cabins or luxurious lodges. You can "rough it" in style! The Delaware Water Gap KOA campground offers the Pocono Mountains' finest family camping. With level pull-through sites as long as 85 feet available, our campground is truly �Big Rig Friendly!� No RV? No problem! Enjoy a comfortable stay in one of our cozy cabins or luxurious lodges. Our level tent sites offer grassy or wooded scenic surroundings for those who want to �rough it� in style. Our KOA campground is a perfect base camp for all your outdoor recreation plans. The Delaware Water Gap National Recreation Area is a boon for canoeists, kayakers, rafters, hikers and scenery seekers. Spectacular Bushkill Falls, near a Native American museum, is worth the short hike. On weekends, visit the indoor flea market, then return to grassy, wooded and open campsites. For more �urban� adventures, visit Hershey PA, Philadelphia and New York City. Shop and sight see to your heart�s content and return to relax in our quiet, comfortable camping area. Open all year, our KOA offers easy access to the winter wonderland at Shawnee Mountain Ski Area, just half a mile down the road. Groups are welcome and can gather in the campground�s meeting pavilion. Enjoy pancake breakfasts on site at Mary T�s Country Kitchen, Saturday bingo in season, and hayrides and miniature train rides. FERN RIDGE CAMPGROUND: Blakeslee. 646-CAMP or 800-468-2442. FOUR SEASONS CAMPGROUND: Babbling Brook Rd., Scotrun. 570-629-2504. FOXWOOD FAMILY CAMPGROUND: 400 Mt. Nebo Rd., East Stroudsburg. 570-421-1424 We have spent the winter making vast improvements throughout the campground. Some improvements include our store, bathrooms and game room. Improvements are still in progress to bring you a memorable camping experience. Nestled in the beautiful Pocono Mountains of North Eastern Pennsylvania, Foxwood Campground offers a close to home retreat from the hustle and bustle of everyday life. We are located less than ten minutes off of Interstate route 80, right on the Pennsylvania / New Jersey border. Relax in our pool, around a campfire, go for a nature walk, or fish in our 1/2 acre well stocked private pond. No fishing license required ! Check out our activities schedule to see what fun filled activities we have planned for each weekend. HEMLOCK CAMPGROUND and COTTAGES: Hemlock Dr., Tobyhanna. 570-894-4388. IRONWOOD POINT RECREATION AREA (PP&L): Greentown.570- 857-0880. JIM THORPE CAMPING RESORT: Lentz Trail, Jim Thorpe. 570-325-2644. KEEN LAKE CAMP--COTTAGE RESORT: Keen Lake Road, Waymart. 570-488-6161 / 488-5000 or 800-443-0412. Keen Lake Camping and Cottage Resort is a privately owned 90-acre spring fed mountain lake, located in the scenic northern Pocono Mountains of Northeastern Pennsylvania just off Route 6. Our campgound offers a variety of accomodations available for you and your family ranging from RV Camping, Popup Camping, Tent Camping, Seasonal & Year-round Cottage Rentals. Our serene natural setting provides fresh, clean country air, a variety of amenities to fit your needs while on your vacation, a complete activities program for the young and young at heart, excellent fishing (large mouth bass, perch, walleye, crappies and more) and the opportunity to relax with your family and friends - to read, to boat, to swim, to walk, to think, to play, and mostly to create precious memories with those you best love. KEN'S WOODS CAMPGROUNDS: Bushkill. 570-588-6381. LEDGEDALE RECREATION AREA (PP&L): Greentown. 570-689-2181. LEHIGH GORGE RV CENTER: Hwy. 940, White Haven. 570-443-9876. OUTDOOR WORLD SCOTRUN RESORT: Rt. 209, Scotrun. 570-629-0620. OUTDOOR WORLD TIMOTHY LAKE RESORT: Timothy Lake Rd., Bushkill. 570-588-6631. PENNSYLVANIA POWER & LIGHT: Hawley. 570-226-3702. PINE HILL CAMPGROUND: Old Rt. 22, Kutztown. 800-217-6776. POCONO VACATION PARK: Schafers Schoolhouse Rd, Stroudsburg. 570-421-8049. PROMISED LAND STATE PARK: Rt 390 Promised Land PA Pike County. 676-3428. About 3,000 acres in size, Promised Land State Park is on the Pocono Plateau, 1,800 feet above sea level, and is surrounded by 12,464 acres of Pennsylvania�s Delaware State Forest, including natural areas. The forests of the park consist primarily of beech, oak, maple and hemlock trees. Two lakes and several small streams add to the park�s outstanding scenic beauty. Camping: flush toilets, warm showers, electric hook-ups There are four camping areas. All campgrounds are near swimming, boating, fishing and hiking. The maximum stay in all camping areas is fourteen days during the summer season and 21 days during the off-season. Campers must vacate the park for 48 hours before setting up again. Alcoholic beverages are prohibited. The ADA symbol indicates that this activity or structure is ADA accessible.Lower Lake Campground opens in April and closes in December. The Beechwood and Northwoods areas are open from early April through Mid-December. Modern facilities are available Memorial Day through Columbus Day. Rhododendron Area is open from Memorial Day through Labor Day. Please contact the park office for specific dates. Pets are permitted on designated sites. Explore the Lower Lake Campground map. 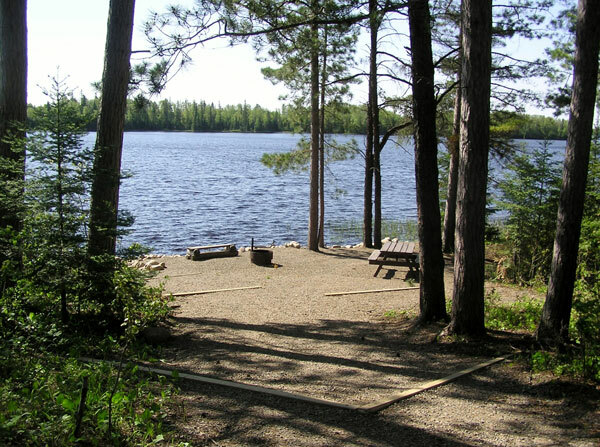 The recently remodeled Pickerel Point Campground is on a peninsula on the southern side of Promised Land Lake. Six modern campsites and three camping cottages are open year-round. Walk-in campsites on the lakeshore and other modern sites will be open from Memorial Day to Labor Day. Pickerel Point Campground now has twelve full hookup sites that include electric, sewer and water hookups on site. These full hookup sites are a first for Pennsylvania State Parks. Explore the Pickerel Point Campground map. The ADA symbol indicates that this activity or structure is ADA accessible.The Pines Campground is at the northwestern end of Promised Land Lake and is open from Memorial Day weekend through Labor Day Weekend. The restrooms have flush toilets. Pay showers are in the Picnic Area. A trail leads to the Picnic Area and the Main Beach. There are ADA accessible campsites. Explore the Pine Campground map. The ADA symbol indicates that this activity or structure is ADA accessible.Tucked into the trees and rocks, Deerfield Campground is just south of Promised Land Lake and is open Memorial Day weekend to Labor Day weekend. This rustic area has flush toilets. Pay showers are in the Picnic Area. RIVER BEACH CAMPSITES on the DELAWARE: Rt. 209, Milford. 570-296-7421 Or 800-FLOAT-KC. SANDY VALLEY CAMPGROUND: Sandy Run Rd., White Haven.570- 636-0770. SILVER VALLEY CAMPSITES: Rt. 209, Broadheadsville. 570-992-4824. TOBYHANNA STATE PARK: Monroe County. 570-894-8336. TRI-STATE RV PARK: I 84 & Rt. 209, Matamoras. 800-562-2663. W.T. FAMILY CAMPING: Rt. 115, Blakeslee. 570-646-9255. Enjoy your stay in the Poconos at one of our many campgrounds. Be sure to visit our PoconosBest.com other guides to the Best things to do in the Poconos while you are here.